Around our homes there is a little-known danger to children. Increasingly found in a number of household items may be a powerful coin-sized battery known as a button battery. Specifically, 3V lithium button batteries that are >20mm in diameter and roughly the same size as a ten cent coin have been associated with the greatest danger when swallowed. With smaller sized button batteries known to cause serious injury when placed in the ear or nose. Often children under five years of age have easy access to devices containing button batteries, with parents unaware that there is a potential risk of injury. When swallowed, a battery can get lodged in a child’s oesophagus. The saliva triggers an electrical current, initiating a chemical reaction that can cause severe burns and tissue damage within two hours of ingestion. Button battery ingestions can have serious complications, often requiring multiple surgeries, and in severe cases may result in death. Diagnosis can be difficult as the symptoms of swallowing a button battery can be similar to other childhood illnesses. Symptoms can include coughing, drooling, discomfort, vomiting, abdominal pain, fever, diarrhoea and respiratory distress. Identify devices around your home that may contain button batteries. Ensure battery compartments are secure, regardless of whether the device is intended for a child. Place devices that contain button batteries out of reach and out of sight of young children. Dispose of batteries safely at a battery recycling collection point. Contact your local council for locations. Share this information with other parents and carers, friends and family members. If a child is suspected of swallowing a button battery call the Poisons Information Line on 13 11 26 immediately. However, if the child is choking or struggling to breathe, phone 000 for an ambulance. Download the Button Battery safety awareness poster to share around your work, school or home. 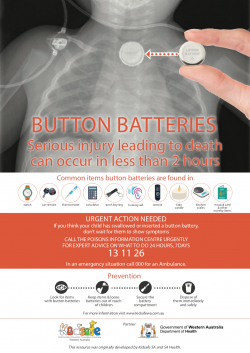 Button Battery Safety Poster download. Download the Kidsafe WA Button Battery fact sheet here.